Ford Motor Company manufactures trucks with 4-cylinder, 6-cylider, 8-cylinder and diesel engines. Pulling a Ford truck engine is straightforward in terms of the steps, and is at least a two-man job. You may be capable of unbolting everything, but an assistant saves crawling out from under the truck to grab a bigger wrench. When it's time to pull the engine, your assistant helps guide it out of the truck. A floor jack is used to support the weight of the engine and a hoist does the heavy lifting. If you are pulling an older engine, spray all bolts with lubricant the day before. Set the parking brake and chock the rear wheels. Raise the engine hood and support it open with random sticks of wood propped under the front corners of the hood. Remove the bolts from the hood hinges. Lift the hood away from the engine compartment and set it aside. Open the radiator petcock and drain the coolant into a utility tub. Disconnect the battery cables from the battery. Lift the battery out and set it aside. Slide the utility tub away from the truck. Remove the upper and lower radiator hoses. Loosen the transmission fluid line fittings from the lower end of the radiator and move the lines away from the radiator. Loosen the belt-adjustment bolts for the fan belts or serpentine belt and remove the belts. Remove the cooling fan and fan shroud. Pull the radiator out of the engine compartment. Work from the top or below the engine. Remove all linkages, lines and any other hoses that attach to the engine. Remove the air cleaner from the carburetor. Pull the engine wiring connectors apart and lay the main wiring harnesses to the sides of the engine compartment. Position a floor jack under the front of the transmission. Lift the jack so it is firmly in place under the transmission. Remove the bolts that attach the transmission to the bell housing. Loosen and remove two intake manifold bolts at opposite sides of the manifold, midway between the front and back of the engine. Attach the ends of a 24-inch long length of ¼-inch chain to the manifold using the manifold bolts. Tighten the bolts securely. Hold the middle of the chain above the engine. Position the arm of an engine hoist above the engine and connect the chain to the hoist arm hook. Raise the hoist arm enough to fully tension the chain. Loosen and remove the motor mount bolts from the truck frame at each side of the engine. Raise the hoist arm in small increments as you ease the back of the engine away from the transmission. Continue to raise the hoist arm enough so the engine clears the front of the engine compartment. Stabilize the engine to prevent it from swinging on the chain. Back the hoist away from the truck. 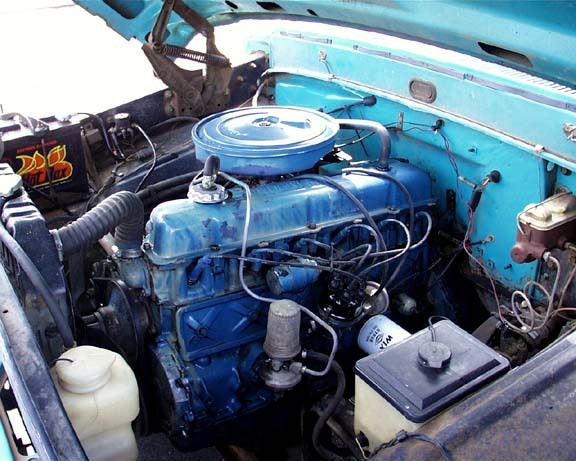 Lower the engine onto wood blocks or mount it on an engine stand. Loosen the manifold bolts that secure the chain to the engine and remove the chain. Truck engines and components vary. Always refer to your service manual before removing an engine.